Celebrate our great country with the newest patriotic collection by ©Dan Morris for QT. 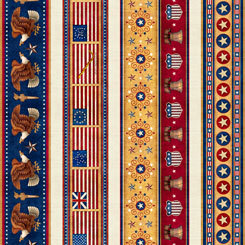 The U.S. flag panel is unique with the smaller patches included. Cut them up or keep it together for a large focal panel. Create a stunning Quilts of Valor quilt to share your American Pride!